NEMA strives to find and promote talented individuals and groups in the New England area. We think that in a venue organized by NEMA, under the supervision of respected judges, in an environment of healthy competition, many talents would blossom and be recognized. How do we attract more talented individuals and groups to perform at NEMA events? How do we take it one more level up with our annual talent show? Last but not least, our commitment to bring the best of the best from the New England area to the Malayalee community. Kalotsav 2008 is a result of the above thought process and brain storming sessions that followed. 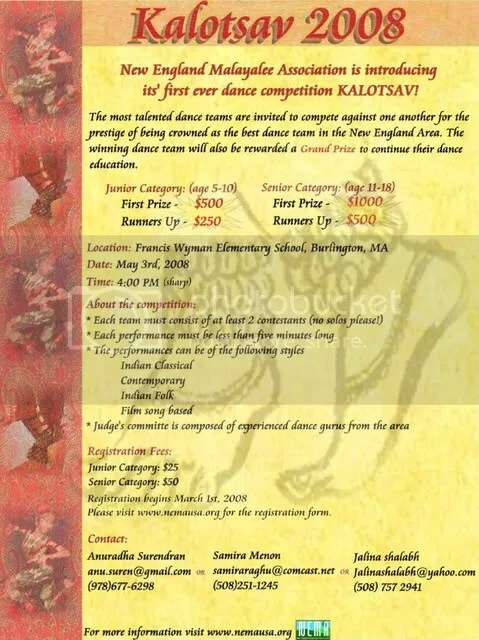 On May 3, 2008, we hope to have a path breaking, pioneering and thrilling Dance Competition. Apart from the competition, we ill also feature our regular non-competitive talent show for those individuals and groups who do not wish to participate in the competition. Please contact Samira Menon or Anu Surendran if you have any questions or need any clarification. Event Registration form could be found here.